Badgers hold the strange position of being one of our most beloved, yet also our most openly persecuted, native species. 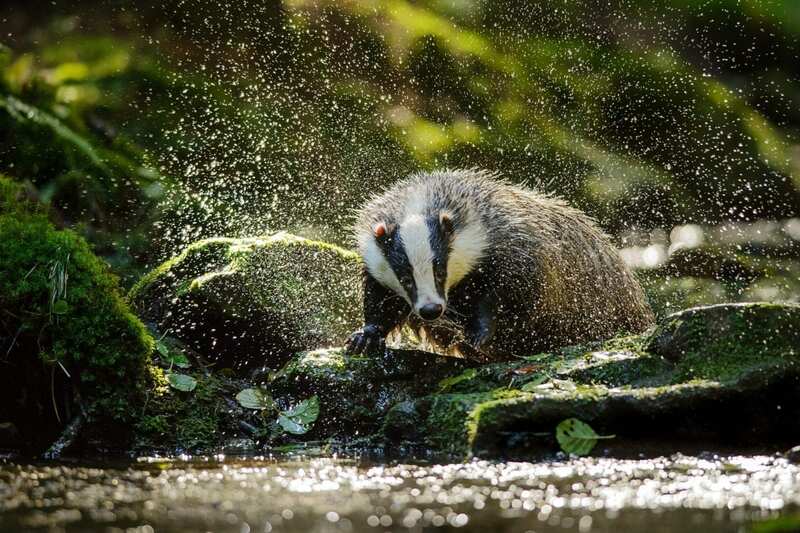 Their instantly recognisable black-and-white striped faces have captured the hearts of many writers and illustrators, and unforgettable badgers have been snuffling their way through classic British literature for years. They are unforgettable characters from such works as The Wind in the Willows, The Tales of Beatrix Potter and Fantastic Mr Fox. Badgers are often depicted as crotchety, but they are in fact shy and retiring nocturnal creatures that avoid human contact. They are incredibly social with one another and live in large family groups in underground setts. They run a tight ship with tidy burrow entrances and latrines close by, but separate from, their homes. Better house-trained than the average teenager, badgers even air their bedding. They will bring the bracken and straw that line their burrows to the well-ventilated entrances of their setts before returning them to their bed chambers. Badgers surface from their setts at dusk to engage in sociable fun and frolics such as grooming, playing and fighting before venturing into the night to hunt and forage. There are four to seven badgers in a sett, and every year some of the young will stay on whilst others roam to find their own territory. Badgers give birth to a litter of up to five cubs from mid-January to mid-March, and the cubs will stay underground for two months before coming above in early spring. In Britain where the winters are mild, badgers may not join the extended winter sleep that their kin of colder claims partake in. Their activity does slow, however, and they will be more active during milder weather. Badgers are Britain’s biggest land predator, and they can pack away hundreds of earthworms a night as well as small mammals, birds’ eggs, earthworms, roots and bulbs. They have stocky bodies and short legs that end in large, flat feet with five long claws that they use for digging. Badgers can live for 14 years, although more usually for around six. In that time they clock up a lot of digging hours, and some elderly badgers’ claws are almost worn away completely through constant use. They have long snouts that are perfect for their digging and rootling behaviours. Male badgers are called boars, while female are sows, and their Welsh name mochyn daear (earth pig) reflects their porcine nomenclature. Despite these nicknames, badgers are completely unrelated to pigs, and are from the family mustelidae and are related to otters, polecats and pine martens. Their favoured habitats are woodlands, and they dig their setts beneath tree roots which help stabilise the soil. Badgers have historically been persecuted, and are now protected under The Protection of Badgers Act 1992. However, government sanctioned persecution is taking place on a wide scale in England. As carriers of bovine TB, badgers have been scapegoated as spreading the disease to cattle and so organised culls have taken place in several areas across the UK. These culls have been heavily criticised by many different animals rights and scientific bodies, such as The Badger Trust and the Zoological Society of London. The government have been criticised for continuing the culls after the trials yielded uncertain results. The farming minister claims that data shows that the badger culls are working, although scientists maintain that there is an absence of any kind of statistical analysis that verifies the government’s claims.Wildlife groups and scientists alike believe that vaccinating badgers would be more cost effective than culling, and of course has the advantage that no badgers would be harmed. Despite the criticisms, a fresh swathe of culling is being enforced in England. Despite the persecution they face, badgers remain one of the nation’s favourite species and are a beloved part of our natural and cultural heritage and unquestionably deserve pride of place in the wildwoods of Britain.